Reverb10 - Day 3: Moment. Pick one moment during which you felt most alive this year. Describe it in vivid detail (texture, smells, voices, noises, colors). (Author: Ali Edwards) See original post on Reverb10.com here. I really had to think about this. Last night, when I got today's prompt - yes, I was on e-mail at 11 p.m. - my first thought was wow, what moment did I feel most alive? What memory can I describe in "vivid detail." What memory deserves this attention. When I woke up this morning, I some how knew, I needed to write the post about my experience "tubing" for the first time this summer.You can read the original post: Lessons from Vacation - Part 1: Laughter here. ok, so I never got all the way up on my knees like Kim (left) I did let go of the handles a couple of times! Riding on the tubes was exhilarating. Riding on top of the water, feeling the wind in your face, was powerful. 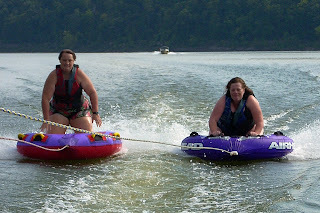 It was hard - wow, I can't believe how much arm strength it took to hold on to the tubes. 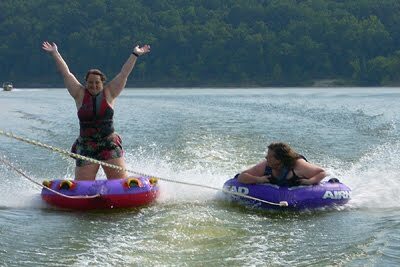 But when I let go and decided to have fun, and not worry about how I looked in a "skin tight" life jacket, it was awesome. Being on the lake itself was awesome. It was so quiet - no cell phones, no laptops, no electronic devices. The weather was nice - even on the hottest days. 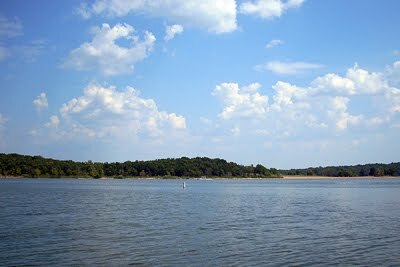 It was funny to be swimming in the water, and feel warm water on the surface, but pockets of cold water at your toes. This was a new experience, that taught me to put aside everything and jump in, to do something - even if it might mean I look foolish. Because honestly, with risk comes great reward - and the reward here was priceless. Thanks Kim, for this awesome memory and for this opportunity. Oh, and thanks for teaching me how to play Rummy 2000, and for just being a "life-long" friend. I value your friendship beyond words. "when I let go and decided to have fun, and not worry about how I looked in a "skin tight" life jacket, it was awesome." funny how that happens, isn't it? let go and soar! I love your breakthrough and how you chose to have fun and free yourself from the negative self talk. LOVE this moment!! it looks like you really enjoyed yourself! it's fun to try new thins and stretch your horizons. A few years ago I went backpacking for the first time. I am not a spring chicken. I am not an athlete. I had no idea what I was doing. But I went, met some great friends, am now more knowledgeable how to keep myself alive and comfortable in the outdoors, and wouldn't trade this experience for the world. Bravo for you. What will you take on next? Oh Kaylea, you made me cry! I am sooooo glad you had such fun! Can't wait for next year!